The heads of Jerusalem’s Church of the Holy Sepulchre have threatened to close the holy site again in protest against a new bill that aims to confiscate land owned by the church, Israel Hayom newspaper reported yesterday. In a letter of protest addressed to Israeli Prime Minister Benjamin Netanyahu the heads of the Church protested against the Minister of Justice Ayelet Shaked’s intention to introduce a new bill that allows the state to confiscate land belonging to the Orthodox Church in Jerusalem. The Israeli minister claims the law aims to protect buildings situated on land owned by the Church where Israelis live and that the Orthodox Patriarchate in Jerusalem had sold the land to Jewish contractors. The bill calls to nationalize the lands which Israel claims to have been leased by the Patriarchate to the Jewish National Fund, Keren Kayemeth, in the 1950s for 99 years. The Jewish contractors claim they bought the land from the Patriarchate in 2010. In February, the heads of the church closed the Church of the Holy Sepulcher in protest against the Jerusalem Municipality decision to modify a religious tax exemption, allowing the municipality to collect tax from properties including restaurants and hotels owned by the church. 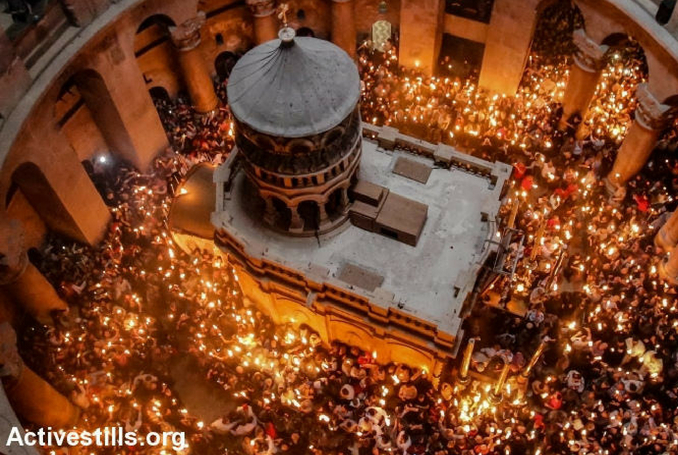 Be the first to comment on "In Protest of Israel Land Grab, Holy Sepulcher Church Threatens Closure #Palestine #GroupPalestine #israelTerrorists #boycottIsrael"